Another MYAU is history. It was a tough one. Temperatures of – 45 degrees Celsius, in some places on the trail possibly even down to – 50 degrees Celsius during the first couple of nights influenced the entire race. After all the warnings about frostbite and other cold related problems I was actually very happy to see all athletes arrive at Rivendell Farm in pretty good shape. That’s all except Ignatios who had a bad cold and Renzo who had stomach problems. Both scratched at Takhini Bridge. The marathon of course was not easy. I believe a lot of water bladders froze at some point and running 42 k with little or no water is difficult. But you all made it! There have been some discussions in our Facebook group if someone running with a dog should be ranked in a different category. Other races do that. As for the MYAU we will not differentiate. Our marathon is not sanctioned. As is the case with the ultra distances our marathon is more about being part of something very special. Records and categories are not a priority. More ultra athletes scratched at Rivendell Farm. They did the right thing as continuing may have caused serious problems. But they had no frostbite. Most of the problems ocurred on the way to Dog Grave Lake and some after. It’s a long way to get there. It’s night and it’s still the beginning of the race when there has not been a lot of time to adapt to the cold. So, getting to Dog Grave Lake without any major issues was a big challenge and even at the checkpoint things were not easy. At that point quite a few more athletes had decided to call it a day. Some did so before they ran into more difficulties. Some already had frostbite. And as much as I know it can happen I always feel sorry for any participant who is faced with this problem. All the training, preparation and money spent and the race is over after the first night. I believe all athletes who did get frostbite will be fine. However, Michal’s case was and is pretty severe. I am sure most of you will have seen the newspaper articles or TV news on his participation. Our first Polish competitor has always kept his spirits high and one of his hands is out of danger. He will know about his other hand in about 4 weeks time. I wish him all the best for the continuing recovery! Were it not for Michal’s case things were within the limits of what I would call „normal“ in these temperatures. I will make some changes to the rules, e.g. temperature rating of sleeping bags and other mandatory gear. However, one thing needs to be clear to all future athletes. And we have always said that. If temperatures do get that cold, this race is dangerous. We can check on everyone as much as we want. The crew can’t be there all the time. And 5 minutes and one mistake are enough to get frostbite. I also want to congratulate all athletes who followed our instructions and dealt with any problems as they were happening or made the decision to scratch before the cold could harm them. And I want to thank the athletes who were so kind to help others! Whilst it was sad to see so many athletes scratch, it was also amazing to see that a lot of athletes got through the cold quite well. Our 100 mile winner Kyle McCoy for example arrived in Braeburn and looked in very good shape. I would say he is a strong candiate for the 300 or 430 miles! Congratulations also to all other 100 mile finishers. You did great! As the race progressed, temperatures were warming up considerably. At this point the worst was over but of course slightly softer snow, wind that made the trail disappear on the lakes, very tough trails on some river sections and simply the long distances still made the going tough. As a consequence some athletes who had gotten through the cold still needed to scratch, e.g. due to tendonitis, skin infections, flue, back or other problems. Therefore, the 300 mile distance only saw three finishers. First in was Neil Thubron (England) followed by Daniel Benhammou (US) and Ryan Shaw (England). Congratulations, guys! On to the 430 miles. It was great to see how Derek Crowe from Whitehorse made sure his fellow competitor Enrico Ghidoni (Italy) got help solving the problem with his bike. Jonah from Icycle came all the way up from Whitehorse for a repair. Unfortunately, it did not last long and Enrico basically pushed his fat bike all the way from Dog Grave Lake to Carmacks. Once there he received a new wheel and then there was no more stopping him. As most of you will know Enrico had already finished the 430 miles as a runner and xc-skier. In these categories he placed 1st each time. And he did it again this year. But what makes Enrico such a special athlete to me is more about his attitude. No matter what difficulty he is facing he always is going strong and his favourite statement: „No problem“ just says it all. Derek came second and really enjoyed his experience. He also wrote a nice article for Yukon news and took some very nice pictures. Up next were Hanno Heiss (Italy) and Peter Felten (Germany). Peter had overtaken Hanno before the finish line but decided to wait for the athlete from Pfalzen just bevor the finish banner and they crossed the finish line together. Hanno was our first athlete into Dawson on foot this year. It was great to see him get there as in Carmacks things were not looking so good for him. Dr. Mathias Steinach had helped him take care of his swolen calves and Hanno got better and better afterwards. Pat Cooke-Rogers (England) came 5th with her fat bike. It was so great to see her finish! It also made her the first woman from Europe to ever reach Dawson. Joel from Spain came 6th overall and 2nd in the foot category. He had bad feet for quite some time but did not let that get to him and just pushed on. Mathieu Bonnier (France) ranked 7th overall and 1st in the xc-ski category. To the sound of ABBA music we then celebrated the arrival of David Erixon and Niclas Bentzer, both from Sweden. They placed 8th overall and 2nd in the xc-ski category. They are also the only team ever to make it to Dawson. They looked amazingly fresh at the finish. We all were impressed with their perfect strategy and their steady performance. Like so many others they were a great example of just being postive all the time, too. Bernhard Hasenbalg (Germany) came in as 10th overall and 3rd in the foot category. Followed by Jessie Thomson-Gladish (Canada) who placed 11th overall and was the first in the women’s foot category. With her was Julie Pritchard (England) who had skipped one stage and therefore did not get ranked. But I am sure had she not been sick for two days she would have made. Last but certainly not least, Sean Brown (England). It was Sean’s 4th try at the 430 miles. We all knew that if he made it through the first two nights it would be his year. And he did get through the initial phase of the race. Not without pain and suffering. But Sean is tough and he had learnt from his mistakes. To me it was very special to see him reach his goal. Something I certainly will never forget. Our sponsors and local partners, the entire crew on the snowmobiles and at the checkpoints. You were all amazing and once again made this race a very special experience for all the athletes and myself. Thank you also to Yann Besrest-Butler our race photographer and the journalists and media crews. Any athletes interested in purchasing photos from Yann, please email him at yann@yannbb.com. To all those of you who are on Facebook. We used our Facebook group quite a lot for updates, sharing of photos and links. If you are on Facebook, please join our group there and you have immediate access to plenty of interesting information about this year’s MYAU. As for the next edition, all interested athletes please keep in mind that in 2016 we do not have the 430 mile distance. It will be happening again in 2017. Entries for next year should be possible in about 2 weeks time. If you want to take on the challenge, please send me an email (info@thegreatoutdoors.de) and I will provide you with the paperwork. At 13:52 today Bernhard Hasenbalg from Germany reached the finish line in Dawson City. He was all smiles of course and told me that several times he was close to pushing the help button due to stomach problems. But he didn’t. Instead he took longer rests and slowed down. And it worked. So great to see him here. Bernhard like so many finishers we see her has got a super positive attitude. Bernhard ranks 10th overall and 3rd in the foot category. Next up were Jessie Thomson-Gladish and Julie Pritchard at 15:55. Like Peter they really impressed us with their big smiles whenever we met them on the trail or at checkpoints. Both looked like they could keep on going to Fairbanks without any problems. Jessie ranks 11th overall and she is the 1st in the women’s foot category. As a matter of fact there has only been one woman ever before making it all the way to Dawson. Unfortunately, Julie had to skip the stage from Pelly Crossing to Pelly Farm. She had been sick for two days and consequently was slower than she had planned. But she recovered and decided to continue from Pelly Farm and do the rest of the race unranked with Jessie. Gary and Josh from the crew left at about 14:00 to drive back to Whitehorse and they took Pat Cooke-Rogers with them. The entire rest of the crew and the athletes who are still here are now waiting for Sean Brown. Go Sean! Go! At 15:15 today Niclas Bentzer and David Erixon reached the 430 mile finish line in Dawson. They rank 2nd in the xc-ski category and 8th overall. Jörn and his friends had the great idea to welcome them with some music from ABBA. It was great fun to watch on this beautiful and sunny day. Niclas and David have impressed us all with their perfect race strategy and of course we all loved their great humor and spirits. I should also mention that physically they seem to have returned from a short walk in a park. Of course they are tired but they do NOT look as if they have just been on xc-skis for more than 400 miles in conditions that some times were more than extreme. Congratulations! Our crew several times checked on Bernhard, Jessie, Julie and Sean. The reports have always been the same. The last one just coming in a little more than an hour ago from Gerard who transported out the gear from Indian River. They are all fine. Bernhard is very tired but still in the lead. He is the one we expect next. Mathieu Bonnier from France reached the Dawson City finish line at 18:55 yesterday. He ranks 1st in the xc-ski division. Overall he is the 7th athlete to finish the 430 miles this year. Congratulations! We are now waiting for David and Niclas from Sweden. Next is the German Bernhard. But it will be a while before he gets here. Julie Pritchards (UK) and Jessie Thomson-Gladish (Canada) are on the move, too. Julie is unranked as we let her skip one stage (from Pelly Crossing to Pelly Farm). Unfortunately, she had been sick for two days and had to slow down a lot. Otherwise, I am sure she would have been just fine. In any case, she is a lot better now and enjoying her time out there. Last on the trail is Sean Brown who is English but has been living in the US for some years now. It is Sean’s third attempt at the 430 miles. He is suffering from sore feet but if he manages to keep a normal speed he should make it. And that would be really awesome! At 10:30 this morning Joel crossed the finish line of the 430 mile race in Dawson. He placed 2nd in the foot category and 5th overall. It also makes him the first Spaniard to ever accomplish this. Joel is fine. He just had lunch with Hanno and Enrico. Now he will enjoy that hot shower and get some rest. Our ski-doo guides are on the trails checking on the rest of the athletes and they took some of our crew with them to get a bit of time out in this beautiful nature. Lucy and I are here in Dawson waiting for Pat. She had a long rest as she wanted to get here in daytime. If will be great to see her! Who’s left in the race? Tonight we saw the arrival of Hanno Heiss winner of the 430 mile foot race who completed the race in 9 days 8 hours and 55 minutes. Congratualtions Hanno, an awesome effort and well deserved. We also welcomed in Peter Felten of Germany, third place in the mountain bike discipline who insisted on waiting until Hanno had caught up with him before he crossed the finish line at Dawson City today. Congratulations to all these superb athletes who have been through extreme temperatures, endless miles of tree lined, snow covered trails, long expanses of frozen lake and frightening patches of river with exposed overflow. But they have reached their goal and can go home happy and proud of their amazing achievement. But what of the others, let us not forget that there is still four and half days to go and 9 athletes still to finish. So who are they? The next one we expect to come cruising into to town is Spaniard Joel Jaile Casademont who may well be in, in the early hours of tomorrow morning or possibly later tomorrow. Then we have Pat Cooke Rogers who will be the first woman to complete the 430 miles on a bike. Sean Brown has been here before, completing the 300 miles in 2007, he’s one determined athlete keeping on returning so we are rooting for him to complete the race this year J. Our Swedish skiers, David Erixon and Niclas Bentzer who, having skied from the bottom of Norway to the top are taking on one of the most difficult ski trails in the world (I know, I speak from experience, so I will be hugely proud of them when they cross the finish line.). Bernhard Hasenbalg has also been here before, he had to scratch from the 430 miles at Pelly Farm in 2013 but has come back doubly strong and is still looking good. He’s currently resting up at Scroggie with Sean ready to take on the world again tomorrow morning. And then we have our ladies … Jessie Thomson-Gladish, local Yukoner, full of determination and drive. We also have Julie Pritchard British resident of Italy who last year completed the Marathon des Sables – talk about extremes – the desert to the arctic in one fell swoop! Go girls! Diane, Jo and Lucy set off on a trip up the trail late last night in search of the elusive Northern Lights. Departing Dawson to the James Bond theme tune they ventured along the Bonanza Creek Road feeling invincible in their SUV as opposed to out on foot, skis or on a bike where they would have felt a tad more vulnerable. Got to hand it to those athletes once more. Stopping briefly to take a few moody shots of empty buildings and the dredger the team of Support Crew Angels looked longingly skyward for a hint of the beauty that is the Aurora Borealis. It never happened before it was time to head back to Dawson to prepare for the imminent arrival of Derek Crowe, the local lad, on his bike. At 0150, with Lucy struck down by a cold, Diane, Jo and a member of the Japanese film crew greeted Derek across the line. It was a fairly muted celebration for fear of upsetting the town folk with too much rowdiness at that time of night. Derek has performed consistently throughout the race and arrived in good shape having awaited the coldness of the night to harden the ground before whizzing his way down from the top of the dome. Brilliant effort and his reward…a warm bed for the night at the Downtown Hotel. Disappointingly he was just a bit too late to make it to the bar for a beer. This morning at breakfast Enrico looked great as he planned his tour of the town and Derek looked fresh and ready to go again. Gary and Josh are heading back to Indian River to await the arrival of our first foot racer Hanno. Gerard is in town and will be going out shortly to relieve Gary and Josh as the rest of the athletes come through. It is with sadness, as always, when we have to announce the retirement of another racer. Marianne Heading scratched at Pelly Farm and will be transported back to Pelly Crossing by Robert for onward passage back to Whitehorse later today. Everyone else is trudging onwards and ever northwards with our full support! Dawson awaits those who conquer the dome. 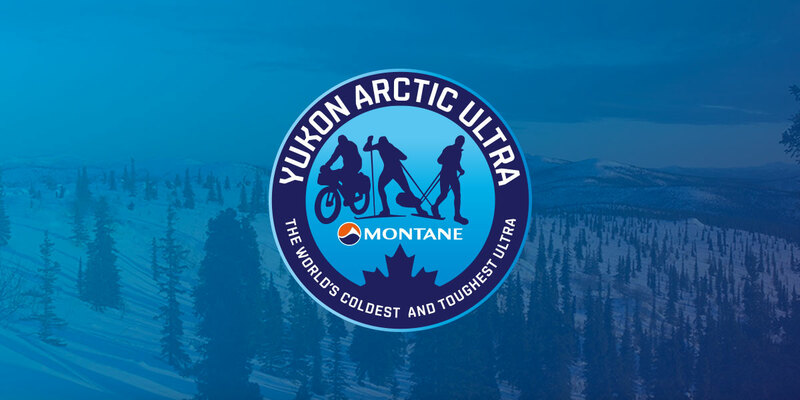 Enrico Ghidoni crosses the finish line to become the winner of the Montane Yukon Arctic Ultra 2015. He has achieved a hatrick having won this event in all three disciplines. Congratulations Enrico, you have proved to be an awesome athlete. Multi complimenti signore Ghidoni!